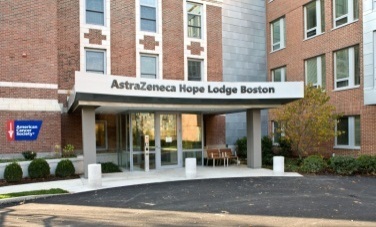 With the generous support of local community leaders and institutions, the American Cancer Society opened the AstraZeneca Hope Lodge Center in Boston in November 2008, a comfortable, inviting, and supportive temporary residential center for patients undergoing outpatient cancer treatment in the Boston area. Since opening in November 2008, more than 2,100 cancer patients from 48 states and 15 international countries have received more than 70,000 free nights at the Lodge, saving an estimated $13 million. The stunning state-of-the-art 50,000-square-foot facility features 40 private guest suites, including a sitting area, full bath, and accommodations for a patient and a caregiver. The common areas include a library, a media room, computer workstations with Internet access, courtyards, and a meal preparation and dining area that encourage patients and caregivers to connect with and draw strength from one another. There are also lovely private spaces throughout the building, perfect for quiet contemplation. Hope Lodge allows cancer patients to focus on recovery, offering transportation to treatment and the on-site resources of an American Cancer Society Community Resource Center. In addition, a schedule of volunteer-run activities gives guests the opportunity for recreation. Thank you for making this dream come true, for connecting cancer patients with lifesaving treatments, and for giving hope a home in Boston. To learn more about the AstraZeneca Hope Lodge Center in Boston visit the website or contact Lodge Assistant Director, Kate Adamson. During the often long and emotional process of treatment, cancer patients receive support at Hope Lodge from professionals, families, friends, and other cancer patients to help build the hope needed during their cancer journey. Every $40 you donate will provide one night of lodging. Not having to worry about where to stay or how to pay for lodging allows guests to focus on getting well.